Aim: The purpose of this investigation was to evaluate the ability of cat's claw, an Amazonian medicinal plant, to treat osteoarthritis of the knee, collect safety and tolerance information and compare the antioxidant, and anti-inflammatory actions of Uncaria guianensis and Uncaria tomentosa in vitro.¶Materials and methods: Forty-five patients with osteoarthritis of the knee were recruited, 30 were treated with freeze-dried U. guianensis, and 15 with placebo. Hematological parameters were assessed on entry and exit of the four-week trial. Pain, medical and subject assessment scores and adverse effects were collected at weeks 1, 2 and 4. The antioxidant and anti-inflammatory activity of the cat's claw species was determined by the α,α-diphenyl-β-picrylhydrazyl (DPPH) free radical scavenging method. Inhibition of TNFα and prostaglandin E2 (PGE2) production was determined in RAW 264.7 cells by ELISA.¶Results: Cat's claw had no deleterious effects on blood or liver function or other significant side-effects compared to placebo. Pain associated with activity, medical and patient assessment scores were all significantly reduced, with benefits occurring within the first week of therapy. Knee pain at rest or at night, and knee circumference were not significantly reduced by cat's claw during this brief trial. In vitro tests indicated that U. guianensis and U. tomentosa were equivalent at quenching DPPH radicals (EC50, 13.6-21.7 μg/ml) as well as inhibiting TNFα production. However, the latter action was registered at much lower concentrations (EC50, 10.2-10.9 ng/ml). Cat's claw (10 μg/ml) had no effect on basal PGE2 production, but reduced LPS-induced PGE2 release (P < 0.05), but at higher concentrations than that required for TNFα inhibition.¶Conclusion: Cat's claw is an effective treatment for osteoarthritis. The species, U. guianensis and U. tomentosa are equiactive. 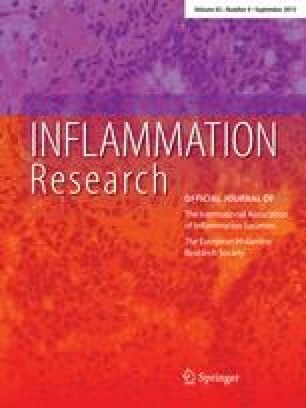 They are effective antioxidants, but their anti-inflammatory properties may result from their ability to inhibit TNFα and to a lesser extent PGE2 production.